Learning how to massage your aching back muscles at home with self-massage tools can bring you massive health benefits while also saving you a packet. Everyone loves getting a nice massage right? As the relaxation, comfort, and peace they bring to you is absolutely sublime. However they do more than just relax you, they are also a great way of keeping your back muscles healthy, loose, and pain-free. As working out any painful muscle knots and kinks helps your body to release trapped waste and toxins. While at the same time delivering blood, oxygen, and nutrients to your damaged muscles and tissues, which helps them to repair and heal. So it's all roses right? Time to book in for regular massages and say goodbye to any muscle pain. However the big problem for most of us is that getting a massage can be super expensive. And with money tight in many households this can be a 'luxury' you can ill-afford. So it gets pushed down to the bottom of your list of priorities. However there is a way for you to still be able to reap the benefits of getting regular massages​ at a fraction of the cost. And that is by learning how to massage yourself at home. Now when you're talking about massaging your back this doesn't sound easy! But don't worry, as you don't need to have extendable arms like Inspector Gadget to be able to do this. Because there are plenty of self-massage tools available that have been designed especially to make it easy for you. Body Back Buddy Self-Massage Cane. 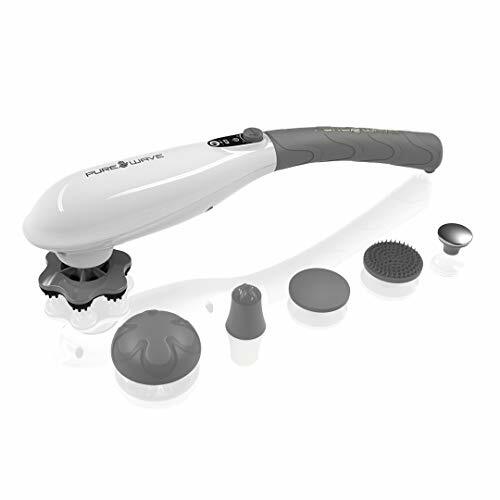 Purewave CM-07 Handheld Electric Massager. Waiting for that magical massage feeling. Going for a massage when your back is feeling tight and achy is a great way of getting rid of the pain. As it's fantastic for getting rid of painful and tight kinks and knots in your muscles that can leave you feeling stiff and sore throughout the day. Because a lot of the time it's these tight muscle knots that are the major cause of people's back pain. As they are are small areas of tight and contracted muscle that form and lead to pain, inflammation, and irritation. And they cause these problems because when your muscles become contracted they cut themselves off from their own blood supply. Your body can't deliver the oxygen and nutrients to your damaged muscles that they need to heal and repair. Waste and toxins become trapped and build up within the damaged muscles, causing them to deteriorate further. And both of these things will only result in further muscle tightness and pain. However the magic of massage is that when you stimulate these muscle knots by massaging them it encourages them to relax and release. Increase the blood flow to areas of damaged muscles again, which will deliver the oxygen and nutrients they urgently need. Unblock the pathways to allow the trapped waste and toxins to be flushed away from the damaged area. By doing this you'll get relief from pain, tightness, and tension within your muscles. While your back will be much happier and healthier as a result. And the great news is you can also feel all of these benefits by learning how to self-massage your own back too. Relax both your body and mind with self-massage. Getting into the habit of self-massaging your body on a regular basis isn't just great for your back. It'll make you feel more relaxed both in body and mind and will calm your nervous system. This will make you less prone to mental and emotional problems such as depression, stress and anxiety. It will improve the quality of your sleep which is when your body regenerates and heals itself. Your range of motion and flexibility will improve allowing you to stay active and do more physically. And you'll have more energy as self-massage will open up blocked energy channels and pathways. It'll keep your body balanced and stable which will help to prevent muscle knots from returning. And help to detoxify the body by flushing out trapped waste and toxins. While reducing your blood pressure. Helps you avoid and get rid of headaches. And releases endorphins which are the body's natural painkiller. It'll also improve your concentration levels so you'll be more productive too. And it'll save you a fortune compared to going for a regular massage. Quite a list of potential benefits! Which are all great reasons to learn how to self-massage on top of reducing your back pain (if I hadn't convinced you already). What Are The Best Self-Massage Tools & Methods? Ok, so you want to try self-massage for yourself but you're not sure how to go about it? Now your back is the one part of your body that you're going to struggle to reach and massage with your own hands. And to get around this problem you need to get one of a variety of self-massage tools that can get right into your tight back muscles. So read on and I'll show you my favourite methods for doing this, explain how each one works, along with a video to show you. I'll also recommend a great self-massage tool for each method so you can try it for yourself. So let's start this list off with foam rollers. Foam rollers are one of the best ways to get right into those hard to reach muscle knots. The idea is to lay down on the foam roller then slowly roll your body up and down over it. As you do this your body weight will push against the firm ridges of the roller, getting deep into your tight muscles. And when you feel like you've hit your are of pain spot on stop rolling and just relax down on it for between 30-60 seconds. This will work wonders as the pressure of your body weight will stimulate your knots and encourage them to release. This makes foam rollers a great and easy tool to use for self-massaging at home, and the one I'd recommend you get for this is the TriggerPoint ﻿﻿Grid Foam Roller. This model in particular is great as it's firm and textured, so it can get right into the spots that may be hard to reach otherwise. It's also the one most commonly used by physical therapists and pro athletes to help them recover from injuries and intense physical activity. So you are guaranteed a top quality product with this one. 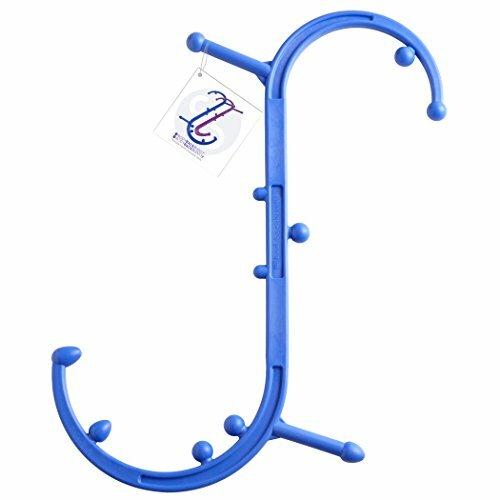 Massage canes have been on the market for a couple of decades now and are a popular choice among physical therapists and health and fitness coaches for working out tight muscle knots. So you may have seen them before but to be honest they can look a bit menacing to the uninitiated! However don't worry, because they are extremely safe and easy to use. The canes are S-shaped and have rounded knobs along with handles at various points around the frame. These knobs are spaced out at intervals​ and are designed to be pressed into your muscle knots. So the idea is to manoeuvre the cane into a position where one of the nobs is pressing on your muscle knot. Then use the handle to pull it forward so it is applying the right amount of pressure to the knot. And the good thing is that you can vary the pressure of this depending on how hard you pull forward, so you have full control. After keeping this pressure applied for a minute or two you will eventually feel the muscle knot begin to spasm and release. Which makes a massage cane a great self-massage tool to have at home, as you can do this every time your muscles are feeling a bit tight and painful. And the best one on the market in my opinion is the Body Back Buddy Self-Massage Cane. This one has sold over a million units around the world and there's a good reason why. Because it comes with 11 therapeutic knobs that ensure you can reach every kink and knot in your back, neck and shoulders. And there are a mixture of both dull knobs for a broad massage and pointed knobs for when you need to penetrate deeper. So if you want to try a massage cane this is the one to go for. Using a massage ball to release tight muscle knots works in a similar way to foam rolling, but in a more targeted way. First you place the ball between your back (close to the painful area) and either the wall or the floor. Then you roll your body over it until it hits the perfect spot. When you feel like you've found it, stop and relax your body weight down onto the ball and let gravity do the rest. This will then stimulate and work the muscle knot which encourages it to release and let go. And this feeling can be so satisfying! This can happen within 30 seconds or it might take a few minutes. However it can give you a much more targeted and intense experience than using a foam roller. This is because you can manoeuvre the ​ball into the perfect position to really penetrate into the muscle knot. And a good ball that will do the trick is the TriggerPoint MBX Ball. As this one is extra firm so can get deep into your tissues and knots. However, if you don't want to buy a massage ball then you probably have a small ball at home that can do the job almost as well. As using things like tennis and lacrosse balls will give you similar results. Acupressure mats may seem like a strange concept at first. This is because they are based on the concept of a 'bed of nails', as real-life beds of nails have been used for centuries as an ancient cure for back pain. Thankfully though acupressure mats are a lot less intimidating! As they are made up of thousands of tiny plastic needles (rather than sharp nails!) that work along the same lines as acupuncture. That is that the body has various acupressure points that can become blocked, and when this happens muscles become tight and contracted. However by laying your body weight down on the mat, the plastic needles are able to stimulate these acupressure points. And by doing so can open up blocked pathways that increases blood flow and causes painful muscle knots to release. They are also a great way to relax your body in general (once you get over the initial weird sensation). And a great one to go for is the Nayoya Acupressure Mat. As this mat is lightweight and portable, so you can take it with you anywhere (which is great for holidays and travelling). And it also comes with a free acupressure pillow so you can relax and release tense muscles in your neck and shoulders too. For the final 3 self-massage tools I'm going to move away from the manual ones and onto electrical ones. And first up is an electrical massage cushion. These are cushions that contain electrical rotating nodes which deliver a massage to your back as you rest your body against them. They are designed to be used while sitting and are great to use whether you at home or in the office. To use one you attach the cushion to the chair you are sitting in using the straps to hold it in place so that it's pressing against the area of your pain as you sit back against it. Then you relax and allow the electrical rotating nodes to massage and knead your muscles. Which is great not just for releasing muscle knots but also for helping you to relax. And a great cushion to try is the Zyllion Shiatsu Pillow Massager. As this one comes with 4 rotating massage nodes that change direction every 60 seconds to give you a thorough massage. And it works on giving you a shiatsu massage which is great for our backs. As shiatsu massage works on the principle of reliving pain and tension by stimulating the body's acupressure points. By doing this pathways are opened which allow blood, energy, and oxygen to flow freely. Which will help your muscle knots to release and heal in no time. 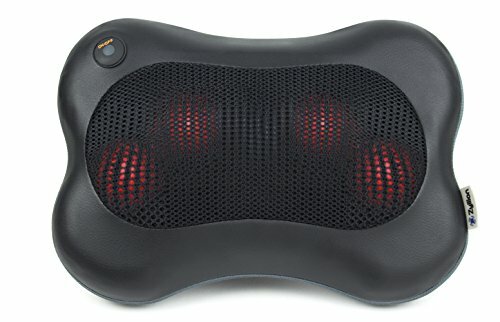 And an added bonus of the Zyllion massage pillow is that it has an option to apply heat to your back as the same time. Which will help your muscles to relax even further and more deeply. TENS units are great for relieving the pain and muscle tightness caused by muscle knots. They do this by sending satisfying and tingling electrical impulses into your body through pads which you attach to your area of tightness. These impulses stimulate and massage the nerves and muscles in the area of the knot, which increases blood flow to it and encourages it to relax and release. And in addition to this, TENS units are also a great tool to help you manage pain. Stimulating your nerves with the electrical impulses overrides the body sending pain signals to your brain, distracting it and giving you some relief. So using one of these is a win-win! And if you want to find a great TENS unit then look no further than the iReliev Rechargeable TEN & EMS Unit. This one is great as it combines TENS therapy which gives you pain relief with EMS (electrical muscle stimulation) therapy which conditions your muscles. And it's really simple to use, with 14 pre-set programs alongside 25 intensity levels that you can adjust manually. It's also portable and lightweight, so you can take it with you and get pain relief anywhere. And using a TENS unit regularly can lessen the need for pain medication, which is another added bonus. Another way to rid your aches and pains is with a handheld electric massager. As this can deliver a deep massage via electrical vibrations to sore and tight muscles which releases the muscle knots that cause pain and inflammation. And by doing this it clears the blocked pathways so your body can deliver the blood, oxygen, and nutrients to heal and repair your damaged muscles. While also flushing out any trapped waste and toxins that cause inflammation within your muscles. So if that sounds like a good tool to massage yourself with, you should check out the Purewave CM-07 Handheld Electric Massager. This one is a great choice as it's lightweight and cordless, so it's easy to reach around and massage your own back or hard to reach areas. And it's powerful enough to get really deep into your tight knots to work them out. You could even get a friend or partner to use it on you for an even more relaxing experience! So one of these handheld electric massagers a great tool for anyone with back pain to have at home. As they can massage themselves with it whenever they feeling in pain. Which will help to keep muscle knots and back pain at a minimum. Regular massages are a great way of keeping the muscles in your back loose and healthy. However, they can be an expensive treatment in the long run and this makes them an unrealistic option for many of us. But you can still reap the health benefits of getting regular massages by learning how to self-massage at home instead. And this will help to free up tight muscle knots and eliminate your back pain, as well as save you some money. So try out a couple of the self-massage tools and techniques recommended in this article and see which ones work best for you. As once you get into the habit of regularly self-massaging your body you'll never want to to stop. And you can then still treat yourself to a professional massage once in a while without worrying about the cost. So learn how to relax both your body and your mind in the comfort of your own home with self-massage tools.